Poll: Which Films ARE You Most Looking Forward To Seeing in January? Last month, at this time, we asked you which four films you were most looking forward to seeing in the month of December. The results are in and it appears that December is going to be all about The Adventures of TinTin, Shame, Sherlock Holmes: A Game of Shadows, and David Fincher’s remake of The Girl With The Dragon Tattoo. Thank you to everyone who voted. Here’s January’s poll. As always, you can vote for up to four films and write-ins are accepted. So, let us know — which films are you looking forward to seeing in January? In one final bit of Oscar Season news, the 2011 Independent Spirit Award nominations were announced on Tuesday. Because of the sheer number of nominees and awards, I’m just going to post the nominees and refrain from offering up any commentary beyond noting that 1) it’s nice to see Drive, Take Shelter, and 50/50 recognized and 2) that the Independent Spirit Award nominations have a pretty iffy record when it comes to predicting and/or influencing the actual Oscar nominations. Yes, Skyrim! Universally heralded as a triumph of gaming. It has received perfect scores at numerous well-regarded review sites and from important critics up and down the world of game reviews. Well, I have an opinion about Skyrim, too. Or, probably a shade more accurately, I have an opinion about Bethesda Softworks, because they’re not getting one penny from me for their new “triumph”, and they’re not going to receive much in the way of praise in this review. So, if you’re an irredeemable fan of the studio, the comments section is open for you to yell at me below. Just understand that you’re coming from a different place than I am. I automatically mistrust any title that Bethesda puts out (and yes, I will be explaining in detail in this article) and I’m predisposed to dislike their games. I do not view them as having a history of putting out excellent games. I can’t name an excellent game they’ve developed. I’m more than happy to discuss within that framework; just let my point of view be understood. I don’t think Bethesda makes good video games, and I never have. That statement, by itself, startles people. That statement, by itself, causes people to leap to Bethesda’s defense. No, I’m told, read this review! It will explain why their latest game is worth buying right away. No, I’m told, Bethesda’s latest title is a great game, you just aren’t giving it a chance. Maybe. Maybe all of that is true. But in my mind, I have a laundry list of completely legitimate complaints, and they arose from trying pretty hard to appreciate the content that Bethesda was providing. For those who are interested in an alternate take on Bethesda, the sandbox “WRPG”, and their various “triumphs” in gaming… there may be some content of interest for you here. My personal experience with Bethesda starts with their 2002 release of Elder Scrolls III: Morrowind. I had absolutely innumerable problems with this game, ranging from the skill-raising / leveling system through the lack of a useful map feature. But in my personal experience, Morrowind was stable, it looked pretty, and it had good intentions. This was a modern-era “WRPG” (which for some reason has become synonymous for some people with “sandbox”. Let’s clear this up now: Bethesda makes “sandbox” games, but this is not a universal feature of the Western-developed RPG). It used modern technology to render its tiny group of facial models, and it told a suitably generic RPG story that was delightfully fleshed out by books, notes, and conversations all around the in-game world. Oblivion continued the grand tradition established in Morrowind. I refused to pay for this game based on my experience with Morrowind, but I was willing to try it out. I borrowed the title from a friend a couple of years after the game had been released. I was alarmed to discover that the game still had unresolved bugs. I encountered graphical glitches and issues (most of them relatively minor, albeit annoying. Because of how modern playtesting works, it’s highly improbable that any game will ever be totally free of texture and graphics glitches), but also weird problems with the AI of both enemies and NPCs. I also encountered problems with enemies that I couldn’t see or locate by any means keeping me ‘in combat’, unable to fast travel or otherwise use the game’s features. None of these problems were, strictly speaking, game breakers. But this was years after launch, and these bugs reared their ugly heads much more often than I’d expect to see even at launch for any professional studio title. Arguments about the size and complexity of Oblivion don’t fly – if you can’t create a game that I can trust be stable and fun at Oblivion’s size, then the game needs to be smaller. You are, as always, entirely free to disagree on this point, but for me it’s no contest. My problems with Oblivion also included the absurd leveling system – I can’t imagine how that system was ever thought to be a good idea – a weak, lazy storyline, unbelievably long loading times, and strictly by-the-numbers gameplay. In short, everything in the game took a back seat to the size of the world. I just can’t imagine how anyone wanted to explore such a huge world limited by such a mediocre game. All of that having been said, I didn’t hate Oblivion the way I hated Morrowind. It wasn’t until I played Fallout 3 that my opinion of Bethesda was cemented. Fallout 3 was essentially just a re-skin of Oblivion; it was meshed with reasonable effectiveness with basic elements of a first person shooter, but on the whole, the game did not break new ground in terms of the game engine. Gone was Oblivion’s crazy level up system in favour of a traditional character improvement system that was essential to recapture the essence of Fallout. So far, so good. Once again, we’re treated to a huge world, and Fallout 3 was visually impressive right from the start. But I played Fallout 3 on its day of launch, and I spent as much time resetting my XBox 360 console and retreading ground I’d already covered after frustrating crash bugs as I did doing anything else. It features all of the same bugs I remembered from Oblivion – occasional graphics glitches, occasionally melded with something more sinister where the game’s collision would allow the player to become inescapably trapped. Bizarre AI problems that cropped up occasionally and mostly fall under the category of ‘vexing, but not game-breaking’. Oh, and the crashes. It’s not a good thing when I have to spend time thinking about saving, and worrying when I can’t save, not because of the game’s difficulty curve or the possibility of screwing things up with a bad decision in the story, but because of bugs. Bugs which I can’t really avoid, because having the game freeze when you bring up the game’s inventory screen is… well, the game can’t be played without that feature. Not for any length of time. Does Bethesda try and patch these bugs? Eventually, yes. But other game studios don’t have to release constant patches to address serious bugs. Other studios don’t launch games that have this many bugs. End users are always going to find glitches that the developer misses; modern playtesting relies heavily on automation, and simply can’t match the penchant for creative mischief that characterizes the gaming community. But the problems with every single one of Bethesda’s releases goes far beyond occasional glitches. As a gamer, I usually don’t spend much time trying to break games, or trying to figure out what weird things I can do with the environment of a game like Fallout 3. The fact that, despite my style, I can’t stop running into bugs, speaks to a deeper issue. Bethesda deserves their reputation for releasing buggy games. And let’s not even get into Fallout: New Vegas, which Bethesda published – doing themselves no credit in the process. So, enough is enough. New releases on the XBox 360 are going to cost about $60 U.S. And I’m not going to pay to support a product that always feels like it was pushed out the door without attention to quality control. And that’s why I won’t be paying one red cent for Skyrim. Frankly, I don’t care how good the game is. I’ve heard almost universally positive things (clouded by the fact that a friend of mine ran into a crash bug in his first hour playing the game), I’ve heard the new engine is wonderful, and that it improves dramatically on the gameplay of Oblivion, that the leveling system is fun and intuitive, and that the game is a visual masterpiece set in an amazingly huge 3-D game world. In fact, I’m almost certain that I would enjoy Skyrim. But enjoying Skyrim would be giving tacit approval to a studio who I have lost all respect for, and who I feel is unworthy of the support of the gaming community. I, personally, feel that Bethesda makes mediocre games which enjoy the benefit of an insane amount of positive press. I’ve always felt that way, as you can see from the brief history I outlined above. But it’s not inconceivable that Bethesda could make a great game. I just can’t vote for them with my dollars. Not anymore. In my previous post, I announced the start of “Oscar season” by offering up a recap of the films and performers honored by the New York Film Critics Circle earlier today. However, the Oscar season was actually kicked off on Monday night with the Gotham Awards. Much like the Independent Spirit awards, the Gothams are meant to honor the best in the year’s independent films. Below is a recap of which films were honored at this year’s ceremony. The big news here has been that Beginners and Tree of Life tied for best picture. (Actually, I’m not surprised as both films pretty much explored the same themes of memory, aging, and love.) It’ll be interesting to see if either one of these films manage to maintain the momentum of their victory through the rest of the Oscar season. As for me, I have a new mission and that is to see Codependent Lesbian Space Alien Seeks Same. This is my favorite time of year. It’s Oscar season, the time when films and actors manuever to win nominations and awards. This is the time of year when anything seems possible, when you think that maybe Exit Through The Gift Shop will get a best picture nomination or perhaps Christopher Nolan will be nominated for best director for Inception. In short, this is the month and a half before bitter disillusionment sets in. During Oscar season, several mysterious groups hand out awards of their own. These groups are made up of critics desperately trying to convince themselves that they matter and the awards that they hand out are often seen as an indicator of what will eventually end up getting nominated. Last year, just about every single critical group named The Social Network as best picture and David Fincher as best director and we all remember how little that actually meant once it came time for the actual Academy Awards to be handed out. Just a few comments on these awards: I have yet to see The Artist but I’m really looking forward to it. I have a feeling I’m either going to love it or else I’m going to hate it with a passion. It just appears to be one of those films. I also haven’t seen Margin Call because its subject matter — Wall Street — makes me go “Bleh!” But I may have to see it now because it appears to be becoming a bit of an awards dark horse. I have a feeling that Brad Pitt’s going to win an Oscar for his performance in Moneyball but I really didn’t think it was anything that special. I thought Pitt was likable but not much else. Some of that could have had a bit to do with the fact that I couldn’t really follow the film as I’m about as interested in baseball as I am in Wall Street. Hopefully, I won’t have to sit through another Aaron Sorkin acceptance speech at next year’s Oscar ceremony. Seriously, there’s only so much time I can spend listening to a pompous millionaire talking about how he thinks the world works. I haven’t seen The Iron Lady yet but its going to be boring and people are going to feel obligated to pretend like they got something out of it. Finally, yay to the NYFCC for awarding both Albert Brooks and Werner Herzog’s The Cave of Forgotten Deams. Tonight marks the mid-season finale of AMC’s The Walking Dead. We won’t get a new episode until the show returns in February to continue with season 2’s second half. One could say that tonight’s episode is the reason why this show has gained such a vocal and loyal following despite it’s many flaws both large and small. This new season has been trying to improve on some of the flaws of the truncated first season by working on rounding out some of the main characters on the show. Whether the writers succeeded in this aspect of the show’s writing has been a hit-or-miss proposition. Characters like Daryl Dixon, Shane Walsh and new ones like Maggie and Hershel Greene become more fully realized during the first six episode this season while others like Rick, Dale, Carol and T-Dog remain too one-dimensional too often through the first half of the season. Then there are plot threads which seem to either drag on too long (search for the missing Sophia) or get too little mention (what is up with the nearly invisible T-Dog through this first half). It’s these inconsistencies which has brought out the even more vocal minority of the show’s viewers who have come to either feel apathetic towards the series or hate it for one reason or another. “Pretty Much Dead Already” is the title of tonight’s episode and what happens throughout this episode goes a long way to rewarding the show’s loyal viewers for their wait through the first six episodes of this season and all its many flaws. It’s en episode which doesn’t come off as subtle with how it explores new themes of whether one belongs in a world of the living dead and does one have to lose their humanity to survive long. The episode also brings to a head the conflict which has been brewing for the last couple episodes between Rick’s group and that of Hershel Greene’s. We see a silent opening of Rick and his group of survivors enjoying a breakfast with the tension in the air thick with unspoken consequences from the previous episode’s deluge of secrets being revealed. While Glenn had revealed the secret of the walkers in the barn to Dale the rest of the group still were kept unawares. Despite look of pleading from Maggie for Glenn to not tell the group he gives in to his conscience and tells everyone the biggest secret and their reaction at this reveal ranged from shock, surprise, incredulity and, finally with Rick, a hint of anger. It how everyone moves forward with this final secret reveal that the episode focuses mostly on. There were still some moments of character development and conflict sprinkled throughout the episode (mainly involving Shane and his distancing from Rick, Lori and others of the group), but the episode’s narrative still moved towards a final confrontation between Hershel’s need to keep the zombies corralled with the hope a cure could be found for them or Shane voicing everyone’s concern that a barn full of zombies was a disaster waiting to happen. Either they took care of the problem while they were still kept relatively harmless or they continue on towards their original plan of reaching Fort Benning. This question finally gets answered with Shane forcefully making the decision for everyone. Jon Bernthal’s performance in the final five minutes of this episode was pretty good and while he teetered on over-the-top level in his anger and frustration at having to make the hard decisions concerning the group’s safety (at least in his own mind) he never steps over the line. The scene where he shows Hershel (as both he and Rick attempt to bring back two more catch-poled zombies back to the barn) made for some very tense and illuminating moments for everyone in the scene. We see understanding from people like Andrea and Daryl who think what Shane is saying is true to the look of horror on the faces of Hershel and Maggie as their idyllic world begins to crash all-around them. Maggie has gradually begun to move away from her father’s viewpoints about the zombies and how they should be treated through the last couple episodes, but to finally see Shane show them the true horror of what the world has become really hits both her father and herself pretty brutal and hard. It’s interesting to note that tonight’s episode actually made a conscious effort to try and humanize the zombies. The way the episode unfolded was almost like the writers were trying to add some credence to Hershel’s way of thinking. This focus was understandable since everyone in the episode either followed Hershel blindly, were beginning to doubt Hershel’s way of doing things or just outright hostile towards it. This made the massacre of the zombies coming out of the barn with Shane leading a veritable firing squad somewhat poignant and sad. Even Glenn joined in on the shooting spree (though not before silently asking for Maggie’s consent) with an earlier personal epiphany about how he had forgotten just how dangerous the zombies were. In the end, even the massacre of the barn zombies wasn’t the biggest shock of tonight’s episode. As the sound of gunfire stopped and the echoes faded away we hear a final zombie come out of the barn’s darkened interior and into the daylight. This was the final secret that finally answered the biggest and most dividing question of the second season of The Walking Dead. Where the hell was Sophia? Her final moments on the show has her coming out last from the barn and everyone’s fears were confirmed and everyone’s hopes about her eventually being found safe and alive were dashed. Even Shane who had been so gung-ho in showing Hershel and Rick that he was the right man for this new world to make the decisions about people’s well-being was left dumbstruck and unable to do what was needed. It took Rick — lambasted by both fans and detractors of the show plus Shane on top of them as being weak and unable to make the hard choices and decisions — to do what was needed. The scene ending with him standing over the body of Sophia after he shot her in the head (with the same Python revolver he used to start the series with the shooting of the little girl zombie in the pilot) made for a sad, poignant and incredible ending to what had been a tumultous story-arc to cover the first half of this new season. The show will return this February. It is safe to say that moving forward the second half will be all about how new showrunner Glen Mazzara sees the show as and how to keep it the momentum of tonight’s episode into the second half. Darabont’s contribution to the show has probably ended with tonight’s episode or, as some have surmised, maybe even a couple episodes earlier. If the latter is the case then his firing from the show, as controversial and polarizing a decision to genre fans who love his work, may work to the show’s benefit. With Darabont we had a creative mastermind who dealt with film, but never with long-form tv shows. Maybe in addition to AMC being penny-pinchers and creating a hostile working arrangement with Darabont was only part of the problem. Could be that Darabont not having any experience writing for TV finally showed and kept the show from fixing some of the writing problems from the previous season. It will be interesting how a veteran tv writer and showrunner like Glen Mazzara will handle a show that tries to explore the conflicts and drama of a zombie apocalypse. 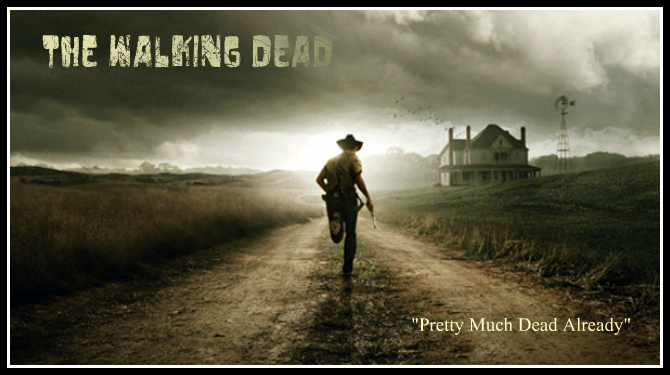 “Pretty Much Dead Already” doesn’t mean the show is now dead on arrival, but it does highlight that the premise which drives The Walking Dead could easily symbolize how this apocalyptic event has killed what humanity some might have had while also highlighting that every zombie killed was still someone’s son, daughter, mother, father, friend and family. In a world full of dead people the walking dead may not be the zombies but the survivors themselves. Once again I like how the show has evolved the character of Glenn. Even when he’s being awkward as he tells everyone the secret of the barn gives a glimpse as to the sort of person Glenn is. Part of him wants to make Maggie happy, but knowing that keeping the secret of the barn will endanger his people and Maggie, he makes the hard decision to tell all even if it means Maggie hates him for it. Glenn shows that he can make the hard choices but do so with his conscience guiding him. This is opposite with how the show has developed Shane this season and how this episode finally shows Shane tipping past his breaking point. Yes, he shows he can make the hard decisions but he does so not with his conscience as his guide but his base, survival instinct. I found it darkly comical how Shane tried to one-up Rick in the eyes of Lori by pointing out how he was the one who has saved Lori and Carl to her. This scene with Lori really makes Shane less the badass zombie killer with people’s well-being in mind, but more of a selfish, sociopath who’s begun to believe all the lies he has been telling everyone and himself to justify his actions. This in contrast to Daryl. While Daryl didn’t have as many scenes in tonight’s episode the ones he was in continued to explore his dual-nature. He will always be the true badass zombie killer in the show, but the show also continues to explore his growing humanity in his steadfast belief that they will find Sophia. It’ll be interesting how the dashing of his hopes on the Sophia subject will affect him moving forward. I like how Daryl also hides behind aggressive reactions to hide his discomfort at others caring about his well-being and his safety. Will Daryl succumb to his inner-Merle and revert to how we first saw him in the beginning of the series as the violent, angry redneck? Or will he finally realize that the group does care and appreciate what he has done and continue on his journey into becoming a part of this post-apocalyptic family unit. T-Dog has been pretty much useless and invisible this first-half of the season. I think I’ll echo what others have been saying about this character. Either give him something to do other than stand in the background or kill him off, but hopefully in spectacular and heroic fashion. Even though Robert Kirkman gave an explanation about Sophia, the barn and Hershel during the after-show Talking Dead live segment I still think the second half needs to fully explain whether Hershel already knew that the girl the group had been searching for and putting themselves in danger during these searches. There still some awkwardness in how child actor Chandler Riggs has been handling the role of Carl, but he’s getting better. I hope this improvement continues because Carl, whether the show follows the comic books or not, will become a major player in this show’s overall narrative sooner or later. Once again, great make-up effects work by Greg Nicotero and his make-up effects wizards at KNB EFX. Their work tonight wasn’t as gruesome as the previous couple of episodes, but their work to give a semblance of humanity to these zombies helped make tonight’s episode one of the better ones, if not the best, of the show. Finally, Andrew Lincoln does his best performance as Rick Grimes. Love how he lets his expression speak for themselves throughout most of the final 5 minutes of the episode. From the helpless look as he fails to stop Shane to finally showing everyone that only he can truly make the hard decision as he finally puts down Sophia while Shane watches helplessly this time around. So, what did people think of tonight’s episode and the whole first-half of this second season. Did you like it? Does the show still have problems to work out with how these characters are written? Will Darabont’s removal and absence in these last few episodes and moving forward make the second half of season two something to look forward to? All comments welcome and will be discussed in healthy, civilized, if heated discussions.